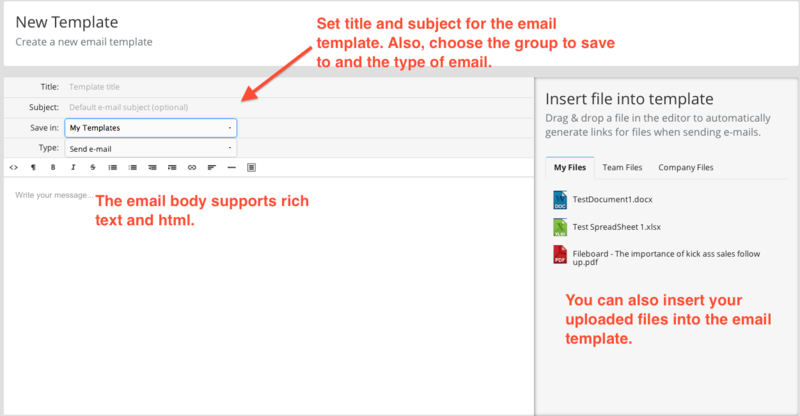 You can create, edit and manage email templates in your Fileboard account. Click on More and click on Email Templates. 2. Click on +New E-mail Template to create a template. Here you can create new templates or edit existing templates. You can also view your own templates, team templates or company templates. These can be adjusted based on whether you are the admin or a team member with specific permissions. 3. Create a new e-mail template. The email template builder allows you to set the template for yourself, team or company. You can also choose what situation this template would be used for like sending a file link, live meeting invitation or a mass emailing. The email body supports rich text. You can add basic formatting, as well as some html. You also have the option to add in files that you have uploaded to your account.